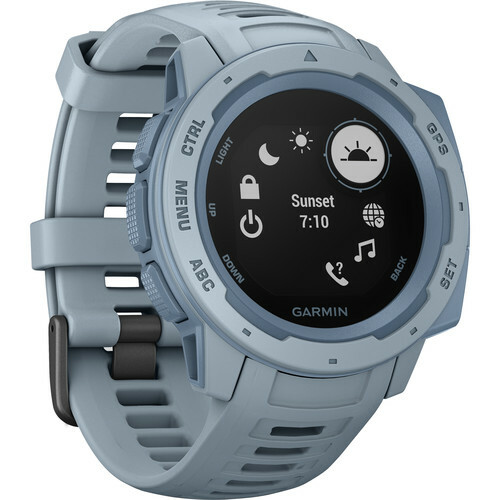 Stay on track with the Instinct Outdoor GPS Watch from Garmin. The Instinct features a built-in 3-axis compass, barometric altimeter, and access to GPS, GLONASS, and Galileo. Using multiple global positioning systems can help provide you with higher accuracy than GPS alone. When you're out on your adventures, you can rely on the Instinct's rugged construction, which supports the 0U.S. 810G military standard for thermal, shock, and water resistance. In fact, the Instinct is water-resistant up to 100m. In addition to tracking your location, the Instinct can track your health as you navigate and travel through the world around you. It features activity and stress tracking, as well as heart rate monitoring. You can share that information online with automatic uploads via Garmin Connect. Speaking of being connected, if you keep the Instinct paired with your smartphone, you can leave the phone in your pocket as call and text notifications come in on the Instinct's scratch-resistant, high-contrast watch face. Whether you're returning back to camp or your car, the TracBack feature is designed to make it easy to find your way out of the wilderness. TracBack remembers the path you took, navigating you back along the same route. Box Dimensions (LxWxH) 4.5 x 4.5 x 2.5"